Discuss the alleged Nazi genocide or other wartime atrocities without fear of censorship. No bullying of fellow posters is allowed at RODOH. If you can't be civil, please address the argument and not the participants. Do not use disparaging alterations of the user-names of other RODOH posters or their family members. Failure to heed warnings from Moderators will result in a 24 hour ban (or longer if necessary). Reading through the section it seems you have nothing to say, so it is unsure why you are bothing to comment at all. A hyperbole is an exaggerated statement not to be taken literally. I think some people here have the nounce to read through your exaggerated styles of effeminate flamboyance and mediocracy and understand your thinking. Believe me to some here, you shine like a beacon, a proverbial XRay moment. If you wish to troll could I suggest you have fun down in the Gulag; this is where the gloves come off and the knives come out, usually going for the Juglar. Both Nessie and Goody have walked away it is noticed. Perhaps you might to help Werds progress in his analysis of the book on the action groups; this would be more helpful than childish pontifications. Hans and I are trying to keep this topic actually serious and detailed. DISMF is derailing the topic like a true troll. Werd keep on being serious and detailed. I am sure Hans will respect this and respond in a manner respecting any gentleman. Your attention to detail Werd has brought you to the attention of some prominent political members. I look forward as do other National Socialists here to your continued discussion. I hope Hans hides his "Judentum", to answer you in a manner befitting a scholar. Not even I can deny what Hans is pointing out. When Mattogno makes several errors or lapses in judgement in his book, they're still worth talking about. Of course CODOH doesn't think so. Every error or potential error in a book is worth pointing out. Keep up your good work please. Once the errors are corrected then judgement on the action groups will continue. Of course we have a million other files to be looked at from Baltic police units and NKVD actions. Please continue with the integrety I know you possess. Credit goes to Hans since he is main one in the HC group who has researched gas vans the most. They got their hands on an Italian copy of Mattogno's book and pointed out many errors that I forwarded to Rudolf that he agreed were errors and should not show up in the English version. Some of the mistakes were so horrible, that ALL MENTION of the 2nd Jaeger report was EXCISED from the English edition. I guess the Italian one needs some reworking therefore. Well, what happened to Jews indigenous to the East, deported from the East, or shipped there is an entirely different question, and I'm sure to a large degree an ugly one. Last edited by Werd on Thu Feb 14, 2019 5:24 am, edited 1 time in total. obviously I don't agree with HC on Auschwitz and the AR camps, but the eastern campaign, this is very new territory not only for me, but even for mainstream holocaust research. Even Rudolf once said in an email that it was largely uncharted territory and despite his conviction of the Nazis being innocent of many accusations relating to Auschwitz and AR camps, what may be uncovered in the east could in fact be very chilling in terms of the loss of human life. Thank you Werd, it is new territory. I am getting the impression that the issues with Eastern Camps were the predominence of Ukrainian guards: there is a strong correlation. It is this uncertainty that predominates the holocaust. This is further confused with previous pogroms in the area, the integration of Baltic cops from all over the place, the Jewish bolshevik aspirations as well as the Soviet Deviousness. The events were a huge mixture of horror, it was to easy to blame the Germans in this context. When Mattogno says, "In the best of cases, the documents attest to 2 Diamond "gas vans" and 4 Saurer: 6 gas vans out of at least 26," he clearly means "the documents" which are only talking about Einsatzgruppe B. Look at all the times he says Einsatzgruppe B on page 309. He doesn't mention any other Einsatzgruppe. You know why? Because he's talking about the Activity Report from 1 March 1942 that is only talking about Einsatzgruppe B. So why are you throwing A, C and D into the mix as if it's a problem for Mattogno when he hasn't even finished his discussion about Einsatzgruppe B? As for why Mattogno bothered to include PS-501 on page 309 on his discussion of Einsatzgruppe B, it must be because a particular van mentioned in PS-501 WAS at one point used in B, but later went to A. No, Werd, it is certan that he refers to all gas vans. The section is called "6.4. Number and Distribution of the “Gas Vans”" - and not number and distribution of the gas vans of Einsatzgruppe B. Indeed, he talks about all gas vans throughout the section. The paragraph in question is firmly embedded between paragraphs on all gas vans. He never says that he limits himself to the gas vans of Einsatzgruppe B in this paragraph. He writes in that paragraph that "In the best of cases, the documents attest to 2 Diamond “gas vans” and 4 Saurer: 6 “gas vans” out of at least 26. There is no information at all about the remaining 20 vehicles. " If your reading were right, he would say that Einsatzgruppe B is claimed to have had some 26 gas vans, which is, of course, an absurd straw man! He clearly means to say that 6 gas vans (he falsely attributes all to Einsatzgruppe B because he has no idea how the Security Police and Service was organized in the East, but that's a different issue) are all of which that are mentioned in any German documents "in the best of cases", which is not quite true. The paragraph in question is firmly embedded between paragraphs on all gas vans. He never says that he limits himself to the gas vans of Einsatzgruppe B in this paragraph. He is saying that those 6 gas vans belong to Einsatzgruppe B. He writes in that paragraph that "In the best of cases, the documents attest to 2 Diamond “gas vans” and 4 Saurer: 6 “gas vans” out of at least 26. There is no information at all about the remaining 20 vehicles. " If your reading were right, he would say that Einsatzgruppe B is claimed to have had some 26 gas vans, which is, of course, an absurd straw man! The "gas vans" are said to have been developed essentially in order to facilitate the massacre activities of the Einsatzgruppen, to whom they had been delivered and precisely for this purpose. According to Beer, of this six presumed "gas vans" from the "first series" (Diamond trademark) build in 1941, one was assigned to Einsatzgruppe C, one to Einsatzgruppe D, and two to Chelmno (Beer, 1987, p. 413); in addition to which another thirty are said to have been assigned in 1942, twenty of which are said to have been consigned in April (ibid, p. 415), one at Chelmno, and the remainder evidently to the Einsatzgruppen. I see nothing in there about 20 belonging to only Einsatzgruppe B. Much less 26. I bet if I ask Rudolf to ask Mattogno, I will be told that Mattogno is NOT saying that Einsatzgruppe B have/had 20 or 26 vans to themselves alone. Okay so which of those 6 vans listed atop page 309 did NOT go to Einsatzgruppe B and why do you think that? Do you for example contest his footnote 254 at the bottom of page 309? Now, are you alright with everything else I posted back here and summarized as follows? 1. Mattogno made a mistake on page 309 of his book when he said that in the Mathias Beer article on page 413, there were two vans that nobody knew where they want. Beer clearly stated where they want. Mattogno either didn't see it, or he did but ignored it and didn't care. 2. There is a typo/discrepancy between the English and Italian editions apparently that Hans pointed out, which would erase any contradictions about Saurer van numbers between pages 323, 326 and 327. But there is still an unresolved issue with the "smaller vans". 3. Mattogno has his chronology about Einsatzgruppe A and Einsatzgruppe B mixed up regarding when each was actually present in Minsk. Because if you are that means I know where you and I both stand clear as day on the issues. When that is settled, I want to take this to Germar Rudolf like I have the other HC critiques, so that we can get some answers. Mattogno only talks about Einsatzgruppe B in this paragraph exactly because he thinks that the only gas vans in German documents are those of Einsatzgruppe B (or what he falsely considers as this paramilitary unit). That's exactly the problem here, and not my misunderstanding. Read the section again (it's not that long, so please really do). 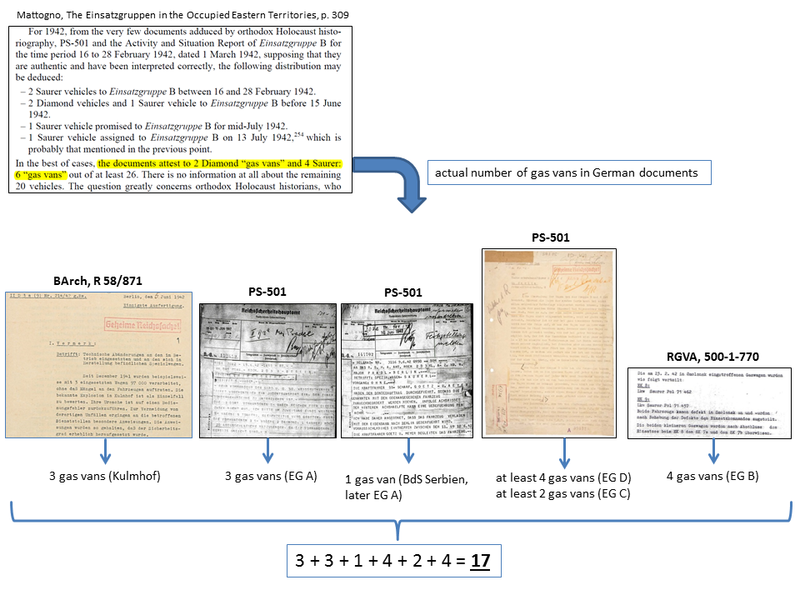 "For 1942, from the very few documents adduced by orthodox Holocaust historiography, PS-501 and the Activity and Situation Report of Einsatzgruppe B for the time period 16 to 28 February 1942, dated 1 March 1942, supposing that they are authentic and have been interpreted correctly, the following distribution may be deduced:"
Nowhere does he say he limits himself to Einsatzgruppe B and is excluding other units. 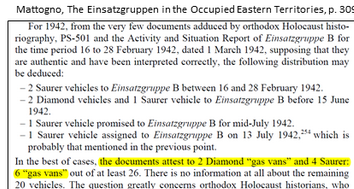 "In the best of cases, the documents attest to 2 Diamond “gas vans” and 4 Saurer: 6 “gas vans” out of at least 26. There is no information at all about the remaining 20 vehicles. The question greatly concerns orthodox Holocaust historians, who make aggressive use of trial testimony without any objective confirmation in attempts to supply even the semblance of an answer...."
The bold part only makes sense if he talks about all gas vans - irrespective of unit. Only if Mattogno means to say those 6 gas vans are the only mentioned in any German document in the best of cases, it makes sense to relate this to 26 (allegedly in total) and state "There is no information at all about the remaining 20 vehicles". Also, only in this case it makes any sense to say that the question of the remaining vehicles (allegedly not mentioned in the German documents) "greatly concerns orthodox Holocaust historians, who make aggressive use of trial testimony without any objective confirmation in attempts to supply even the semblance of an answer". You have misunderstood me. I said "If your reading were right, he would say that Einsatzgruppe B is claimed to have had some 26 gas vans...". Since your reading is wrong, he did no claim about 26 gas vans of Einsatzgruppe B. In fact, my argument is exactly that because no sane person would talk about 26 gas vans of Einsatzgruppe B (no even Mattogno), your reading of him that he only referred about Einsatzgruppe B in this paragraph has to be wrong. Yes, they would tell this. And they are right. Because Mattogno talks about the gas vans of all Einsatzgruppen here, as I say, and not only about Einsatzgruppe B, as you assume. They will tell you that my understanding is correct. Please ask them!